A human IL-10 expression vector was transfected into high endothelial venular ('HEV') cells (SVEC4-10); we then examined TNF-α induced lymphocyte adhesion to lymphatic endothelial cells and TNF-α induced expression of MAdCAM-1 and compared these responses to control monolayers. Transfection of the IL-10 vector into endothelial cultures significantly reduced TNF-α induced, MAdCAM-1 dependent lymphocyte adhesion (compared to non-transfected cells). 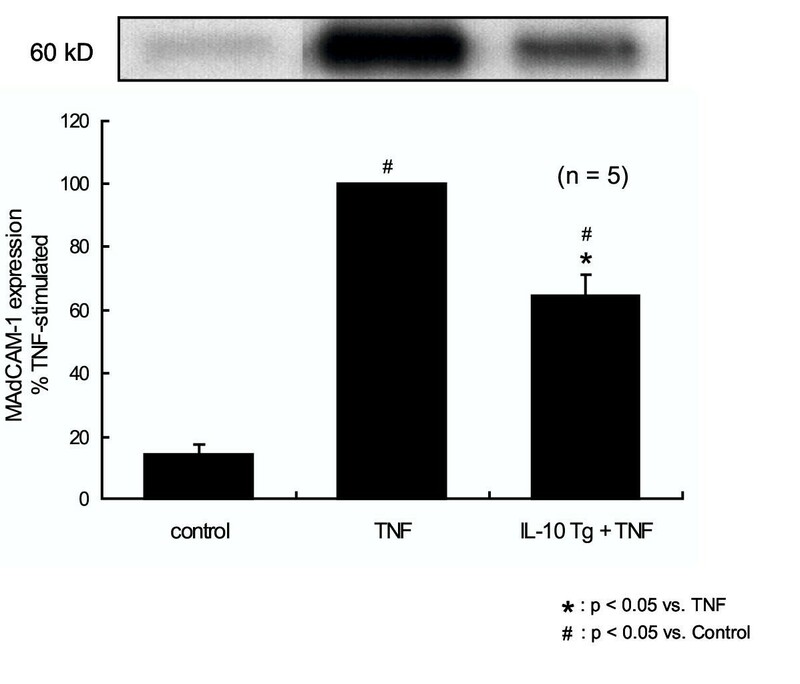 IL-10 transfected endothelial cells expressed less than half (46 ± 6.6%) of the MAdCAM-1 induced by TNF-α (set as 100%) in non-transfected (control) cells. Our results suggest that gene therapy of the gut microvasculature with IL-10 vectors may be useful in the clinical treatment of IBD. Endothelial cell adhesion molecules ('ECAMs') play essential roles in the development of chronic inflammation by recruiting leukocytes, especially lymphocytes to tissues. ECAMs support several forms of leukocyte adhesion including rolling, firm adhesion and extravasation . Infiltration of tissues by leukocytes is a common hallmark of many chronic inflammatory states that include the inflammatory bowel diseases (IBD), ulcerative colitis (UC), and Crohn's disease (CD). In the setting of IBD, the expression of ECAMs like ICAM-1, VCAM-1, and MAdCAM-1 (mucosal addressin cell adhesion molecule-1) is observed in experimental models of colitis, [2–5] and also within the inflamed human colon in Crohn's disease and ulcerative colitis [6, 7]. Among the adhesion molecules up-regulated in IBD, MAdCAM-1, the mucosal cell adhesion molecule, is thought to be preeminent in the development of chronic gut inflammation. MAdCAM-1 is normally expressed in the gut, and its expression is dramatically amplified during inflammation [2, 3]. The functional significance of increased appearance of MAdCAM-1 in IBD is supported by several reports which show that immunoneutralization of either MAdCAM-1 or its ligand, the α4β7 integrin, attenuate inflammation and mucosal damage in animal models of colitis [8–10]. However, since monoclonal antibodies directed against other ECAMs, particularly VCAM-1, can as well reduce disease activity in colitis models [11–14], the literature suggests that MAdCAM-1 is probably necessary, but insufficient for the maximal penetrance of experimental and probably also clinical IBD. Based on these findings, it is apparent that a better understanding of the mechanisms regulating ECAM expression, especially that of MAdCAM-1, might help to devise improved therapies for colitis. It has been suggested that pathologic activation of the mucosal immune system in response to antigens is a key factor in the pathogenesis of IBD. Furthermore, changes in leukocyte migration and cytokine production appear to contribute the perpetuation of IBD . Based on modern advances, recombinant anti-inflammatory cytokines (i.e. IL-10) treatment is now being developed for experimental colitis and human IBD. IL-10 produced by macrophages and monocytes appears to limit chronic inflammation [16–18], through a decreased release of inflammatory factors (IL-1, IL-6, IL-12, TNF-α, GM-CSF, GCSF), suppression of adhesive determinants (MHC class II molecule, β7), and by blocking ICAM-1 induction [19–24]. Conversely, IL-10 gene-knockout mice develop a chronic colitis that is extremely similar to IBD . IL-10 treatment can reduce inflammation in several models of colitis [26–30] and human IBD [31–35]. However, the clinical efficacy of systemically administered IL-10 for patients mild to moderately active Crohn's disease has not been as effective as hoped [33–35]. Furthermore the efficacy of IL-10 administration in mouse colitis models is contentious . We have described in vitro that exogenous IL-10 can block the expression of MAdCAM-1 in response to TNF-α, and attenuates lymphocyte adhesion to lymphatic node derived endothelium under cytokine stimulating conditions via NF-kB inhibition . The purpose of the current study was to show that induction of endothelial expression of IL-10 through an IL-10 expression vector attenuates MAdCAM-1 expression in response to TNF-α and optimistically suggests the possibility of targeted Th2-cytokine gene therapy in IBD. Recombinant mouse TNF-α was purchased from ENDOGEN (Stoughton, MA) amd plasmid containing human IL-10 (phIL-10) was generous gift from Dr. Meng X (Thomas Jefferson University, PA). The SVEC4-10 line is an endothelial cell line derived by SV40 (strain 4A) transformation of murine small vessel endothelial cells, originally isolated from the axillary lymph node vessels of an adult male C3H/Hej mouse [37, 38]. These cell types were all maintained in Dulbecco's modified Eagle's medium (DMEM) with 10% fetal calf serum with 1% antibiotic/ antimycotic. Cells were seeded into 24-well tissue culture plates at approximately 20,000 cells/cm2, and cultures were used immediately upon reaching confluence (usually 3–4 days after seeding). The mouse CD8+ T cell lymphoma TK-1 cells (that constitutively expresses the α4β7 integrin ) were obtained as a generous gift from Dr. Eugene Butcher (Stanford University, CA). These cells were cultured in RPMI-1640 medium supplemented with 10% FCS and 0.05 mM 2-mercaptoethanol (minus antibiotic/ antimycotic). The pCYIL-10 vector is an expression vector which was established by Dr. Xianmin Meng based on the pCY4B vector . Cultured SVEC endothelial cells seeded in 24 wells were transfected at 70% confluency with SuperFect (Qiagen). Briefly, 1 μg plasmid DNA was diluted with 60 μl DMEM and then 5 μl Superfect (3 mg/ml) was added. After incubation at room temperature for 10 min, the complex was mixed with 350 μl medium and added to the each wells. After 2 h at 37°C, 5% CO2, the complex was aspirated and washed 2 times with medium following replace by 1 ml of medium. After incubation at 37°C for 24 h cells were stimulated with TNF-α. 24 h of IL-10 gene transfer, monolayers were treated with TNF-α (1 ng/ml, 24 h). All cell samples were harvested at 24 hours. Equal quantities of protein (75 μg) from each sample were electrophoretically separated on 7.5% SDS-PAGE gels. Gels were transferred to nitrocellulose membranes (Sigma) and blocked with 5% milk powder in PBS at 4°C (overnight). These membranes were washed twice for 10 min with wash buffer (0.1% milk powder in PBS). Primary rat anti-mouse MAdCAM-1 mAb was added at a concentration of 10 μg/ml and incubated at room temperature for 2 h. These membranes were washed twice with wash buffer. Secondary rabbit anti-rat horseradish peroxidase conjugated secondary antibody (Sigma) was added at a 1:2000 dilution for 2 h. Lastly, membranes were washed 3 times and developed using the enhanced chemiluminescence (ECL) detection system (Amersham, La Jolla, CA). The density of MAdCAM-1 staining was measured by scanning the 60 kD band, using a HP ScanJet™ flatbed scanner. Images were analyzed for density using Image Pro Plus™ image analysis software (Media Cybernetics). The data are expressed as a percentage of TNF-α-induced level of density. In each protocol, treatments were performed at least in triplicate. Briefly, TK-1 cells were suspended in culture medium and fluorescence labeled by incubating TK-1 cells at 2 × 10 6 cells/ml with 0.02 mg fluorescein diacetate (FDA) (Sigma) at 37°C for 30 min. The cells were then washed twice with ice-cold HBSS, spun at 250 g for 5 min to remove unincorporated fluorescence and suspended in HBSS. The TK-1 lymphocyte cell line used in this assay expresses high levels of the α4β7 integrin, [39, 41] which can interact with multiple ligands including mucosal addressin-1 (MAdCAM-1), as well as VCAM-1, L-selectin and fibronectin . In this system, TNF-α stimulated TK-1 adhesion to SVEC4-10 endothelial cells is at least 50% MAdCAM-1 dependent . SVEC monolayers were grown in 48-well plates as described, and to activate endothelium, the monolayers were incubated with TNF-α (1 ng/ml) for 24 h. Cytokine treated endothelial cells were washed three times with media. Labeled TK-1 cells were then added to the endothelium at a 5:1 lymphocyte to endothelial cell ratio  and allowed to bind for 30 min under static conditions. At the end of the incubation period, the supernatant was removed and the monolayers were washed twice with HBSS. Plates were read on a Fluoroskan Ascent (Labsystems, Helsinki, Finland) set for excitation at 485 nm, and emission at 515 nm. Blank wells (0% TK-1 adhesion) were run as controls that did not contain labeled TK-1 cells. The data are expressed as a percentage of TNF-α-induced level of fluorescence. In each protocol, treatments were performed at least in triplicate. All values are expressed as mean ± SD. Data were analyzed using multiple comparisons. Probability (P) values of < 0.05 were considered significant. To screen for the efficacy of IL-10 transfected SVEC, we initially measured the IL-10 concentration in the medium prior to gene transfection. There was no detectable human IL-10 signal in the non-transfected cell medium (control), nor any mouse IL-10 (data not shown). However, the medium from the IL-10 transfected SVEC medium showed a large and significant increase in the IL-10 concentration (1209 ± 2 pg/ml) at 48 h after IL-10 gene transfection (Figure 1). Importantly, SVEC cells transfected with this vector showed no evidence of toxicity, altered proliferation and morphologically were indistinguishable from mock-transfected and untreated controls. Secretion of human IL-10 concentration by transfected endothelial cells. There was no detectable human IL-10 signal in the non-transfected cell medium (control). However, the medium from the IL-10 transfected SVEC medium showed a large and significant increase in the IL-10 concentration (1209 ± 2 pg/ml) at 48 h after IL-10 gene transfection (n = 5). (# p < 0.05 from control). One-way ANOVA with Fisher's PLSD test. The anti-inflammatory effect of IL-10 gene transfection in endothelial cells was measured by the reduction in the expression of the endothelial cell adhesion molecule MAdCAM-1 induced by TNF-α (1 ng/ml, 24 h). TNF-α strongly induced expression of MAdCAM-1. This effect was significantly reduced by IL-10 gene transfection (Fig. 2). Alone, the IL-10 gene transfection had no effect on MAdCAM-1 expression. IL-10 gene transfected SVEC is resistant to TNF-α induced MAdCAM-1 expression. TNF-α (1 ng/ml, 24 h) significantly increased expression of MAdCAM-1 and this was significantly blocked by IL-10 gene transfection. Alone, IL-10 gene transfer had no effect on MAdCAM-1 expression (n = 5). (* p < 0.05 from TNF-α, # p < 0.05 from control). One-way ANOVA with Fisher's PLSD test. Having established that IL-10 gene transfection exerts a significant protective effect against TNF-α stimulated endothelial MAdCAM-1 induction, we next examined the effects of IL-10 gene transfection on the adhesion of α4β7 expressing lymphocytes (using the mouse cell line TK-1) to endothelial monolayers. TNF-α stimulation (1 ng/ml, 24 h) significantly increased the adhesion of TK-1 lymphocytes to SVEC monolayers. IL-10 gene transfection significantly reduced TK-1 adhesion in response to TNF-α stimulation at 24 h (Fig. 3). Alone, IL-10 gene transfection did not modify the basal level of lymphocyte adhesion to the endothelium without TNF-α treatment. 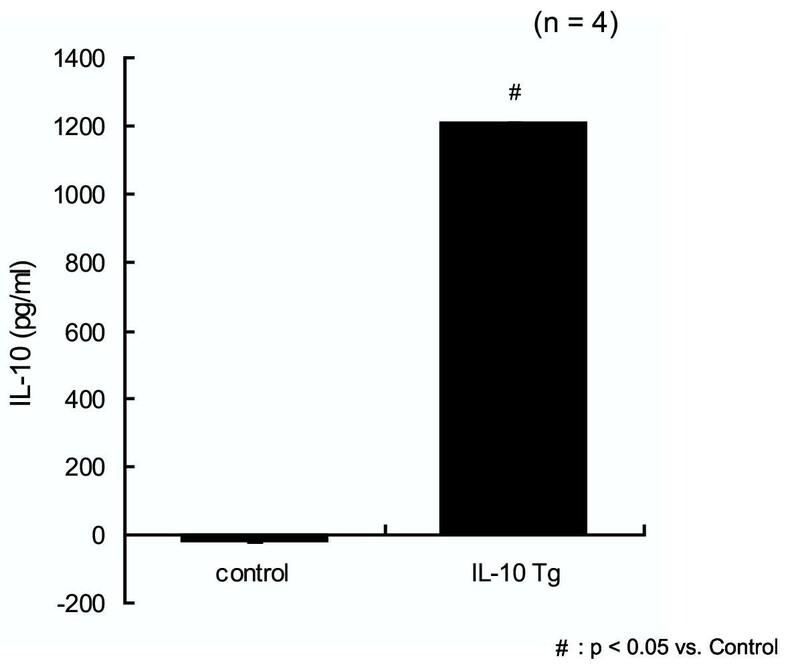 IL-10 gene transfer blocked TNF-α induced lymphocyte adhesion on SVEC. TNF-α stimulation (1 ng/ml, 24 h) significantly increased the adhesion of TK-1 lymphocytes to SVEC monolayers. 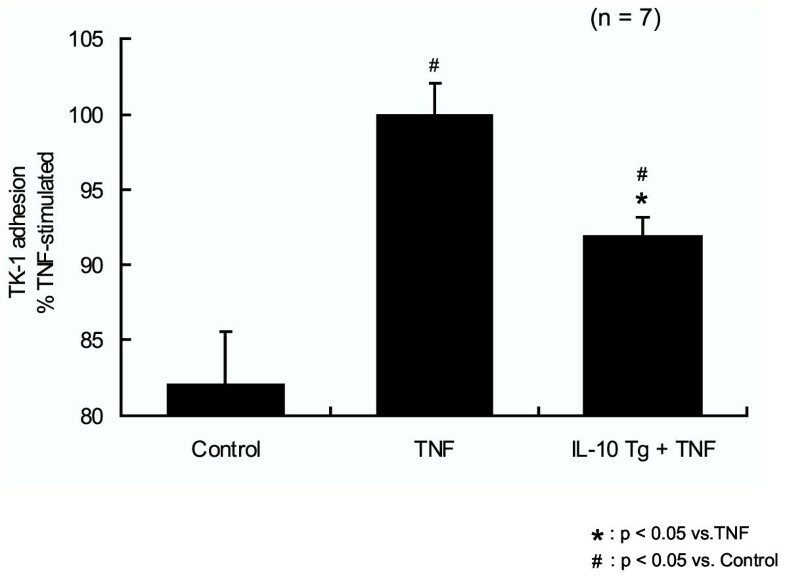 IL-10 gene transfer significantly reduced TK-1 adhesion in response to TNF-α stimulation at 24 h. IL-10 gene transfer did not modify the basal level of lymphocyte adhesion to the endothelium without TNF-α treatment (n = 7). (* p < 0.05 from TNF-α, # p < 0.05 from control). One-way ANOVA with Fisher's PLSD test. MAdCAM-1 is a 60 kDa endothelial cell surface molecule that is strongly expressed by mucosal endothelial cells, particularly following exposure of these cells to pro-inflammatory cytokines such as TNF-α. Expression of MAdCAM-1 has also been reported in the brain, and in the heart [44, 45]; based on these findings, it is now been suggested that MAdCAM-1 might play roles in chronic inflammation of these organs as well. With respect to inflammatory bowel disease, MAdCAM-1 appears to be essential to the lymphocyte homing to the mucosa associated lymphoid tissue (MALT) [6, 37, 38, 46]. Since MAdCAM-1 is normally expressed mainly within the gut microvasculature, and is dramatically amplified during IBD, it has been suggested that increased MAdCAM-1 expression contributes to the etiology of IBD through its ability to direct homing of lymphocytes to the gut. This notion is well supported by several reports that show that antibodies directed against either MAdCAM-1, or its lymphocyte ligand, the α4β7 integrin will significantly attenuate several indices of gut damage in experimental models of colitis [9, 47]. Several studies have indicated that T helper (Th1) immune response has important roles in the development of IBD [48–50]. Moreover, dysregulation of cytokine networks is involved in Th1-dominant immune responses in IBD [48–50]. Among the Th1 cytokines, TNF-α is thought to be perhaps the most important cytokine responsible for driving the onset and evolution of IBD. Because of this prime role of TNF-α in IBD, anti-TNF-α antibody therapy has been very successfully used in IBD to reduce both colonic injury and expression of ECAMs in IBD . IL-10, a cytokine produced by activated macrophages and Th2-type T cells, has crucial inhibitory effect against several Th-1 type immune responses, such as the antigen-presenting functions of monocytes and macrophages [52, 53]. IL-10 may play an important role in preventing the induction of IBD, since animals deficient in IL-10 will develop colitis spontaneously, and low levels of IL-10 are positively correlated with recurrences of Crohn's disease [25, 54]. However, unlike TNF-α based therapies, the administration of recombinant IL-10 (rIL-10) shows poor clinical efficacy. This may reflect the fact that TNF-α therapies for IBD are aimed at efficiently clearing TNF-α, while IL-10 therapies must increase IL-10 and recombinant IL-10 is likely too rapidly cleared from the circulation after in vivo administration to provide a uniform protection . On the other hand, IL-10 gene transfer technology has been used with some success in models of colitis, however its effectiveness is also variable. One reason for this variability may be that the final serum IL-10 concentration of gene-transfected mice might be below the critical threshold needed for gut protection [55, 56]. Therefore targeting of the IL-10 gene to the inflamed colon should ideally exploit tissue (i.e. gut) specific promoters to control selective organ gene transfer technology, endothelial specific promoters and also organ specific intra-arterial injection of vector to activate some genes in specific locations . Administration of IL-10 in vitro prevents TNF-α stimulated expression of MAdCAM-1, and also blocks lymphocyte adhesion to endothelial cells to the same extent as dexamethasone treatment, currently a key therapy in IBD . Interestingly, the low basal levels of MAdCAM-1 expressed by control (cytokine unstimulated) cells were not affected by IL-10 transfection. This suggests that basal expression of MAdCAM-1, is IL-10 independent, while cytokine stimulated MAdCAM-1 is modulated by IL-10. While we previously showed that delivery of IL-10 to the endothelium in vitro is protective against TNF-α , in vivo IL-10 has not been as effective. There are at least two regulating pathways in ECAM expression, one is a cytokine-dependent pathway which is widely studied and the other is cytokine-independent . IL-10 apparently prevents cytokine-induced NF-kB binding activity to the ECAM promoter  and blocks the excessive expression of ECAMs in cytokine-mediated inflammatory conditions. In this regard, IL-10 has been used as a treatment in inflammatory diseases, like IBD for precisely this reason: because it has few effects at sites remote from inflammation. Similarly, we found that IL-10 transfection did not affect cell morphology, total protein level, or the expression of actin and vimentin in these cells (measured by Ponceau red S staining density on immunoblots). Therefore methods like endothelial gene transfection/transfer in vivo may effectively maintain adequate IL-10 concentrations near the endothelial cells that finally achieve the protection against cytokines that is not uniformly produced by systemic IL-10 administration. The most important index for how well gene mediated recombinant IL-10 delivery might work in IBD appears to be measurement of the inhibition of lymphocyte-endothelium binding mediated by TNF-α induced MAdCAM-1 expression. In this experiment, IL-10 induction in the endothelium efficiently blocked TNF-α induced MAdCAM-1 expression and α4β7-dependent lymphocyte adhesion on SVEC endothelial cells. IL-10 deficiency in colitis increases expression of several ECAMs including ICAM-1, VCAM-1 and MAdCAM-1 . We performed an experiment, where under non-stimulated conditions only 55.7 ± 5.4% as many of the TK-1 lymphocytes bound to SVEC compared to TNF-α stimulation (100%, or 'maximal' binding). TK-1 were seen to interact with SVEC through ICAM-1 as well MAdCAM-1, but not VCAM-1, since an antibody against MAdCAM-1 reduced adhesion to 27 ± 4.6% of maximum and an anti-ICAM-1 reduced adhesion to 54.6 ± 8.3 % of maximum; anti-VCAM-1 reduced adhesion to 91% of maximum (blocks lymphocyte adhesion to endothelial cells (data not shown). Therefore we feel that adhesion in this system is mostly MAdCAM-1 dependent. IL-10 transfection of endothelial cells reduced MAdCAM-1 expression by 42% (following TNF-α stimulation) and reduced TK-1 adhesion by 50%. Therefore, these data suggest that the reduction of TK-1 adhesion is approximately 84% (42%/50%) MAdCAM-1 dependent, and that the remaining 16% of adhesion depends on other ECAMs, (such as ICAM-1). Although tissue specific promoters might further increase the organ specificity and transgene delivery of this approach, they have not been evaluated in this report. Our findings suggest that lymphatic or gut endothelial transfection with Th2 cytokines like IL-10 may be an effective method to reduce important clinical symptoms associated with IBD which are mediated by MAdCAM-1 dependent lymphocyte adhesion. This work supported by NIH grants HL47615, DK43785 and DK47663.